The year 2016 is just a few months away, and I thought I’d take a look at the prominent astrological trends happening that year, especially as regards the United States. 2016 is the year we must pass through to reach the end of the decade, and for the US it is important since it is an election year, with no incumbents. We have seen three elections recently that could shed light on how the populace feels about the state of their government. In Greece, a election recently put the maverick Syriza party in power, and expressed the disgust of Greek citizens at the austerity that had been imposed upon their country by the European Union, and especially by Germany, the strongest country in the EU. Then there was a recent election in Alberta, a province in Canada. There, the New Democratic Party (NDP) was elected to full majority of seats, defying the Conservative Party that had always been the strongest in that province and also rules Canada. Even more recently the election in Great Britain showed a large majority (only in Scotland) voted for the Scottish National Party (SNP) which deprived the Labor Party of almost half the seats from Scotland and greatly reduced its strength in Great Britain. In all these cases a third, and progressive-leaning, party took votes from the more established two parties in their respective countries. Do these elections results cast any light on the upcoming US Presidential election? The state of democracy is different in the United States. There the political landscape is controlled by two dominant right wing parties (but of course the same could be more or less said about those other countries, though in no other country is the right so all-powerful as it is in the United States), though some believe that these two political parties are just two branches of the dominant Business Party, and third progressive parties have a difficult time since a vote for them and not a vote against one of the two dominant factions involves a leap of faith, and needs large numbers of people to make the same choice at the same time, which requires trusting other people. But that is unlikely to happened in the atomized society of the US. So while the election results in these three other countries may shed some light on the US elections, that things won’t turn out nearly the same way seems more likely. Note that I am ignoring the recent election results in the country of Israel since they are seemingly different. In that country there was a concern with growing inequality, something that is felt in many other countries, but it was overruled by national security issues, they same as may be the case in the United States, since US citizens still have a year for events to play out. One notably transit to the US chart is Saturn over the Ascendant of the US, lasting in the whole year and being exact three times during the year. The symbolic meaning of this would be depression in showing ones true self or possibly feeling inhibited. To get a better idea, let us look at the two previous conjunctions. The last time Saturn was on the Ascendant of the United States was in 1986. This was the second half of President Ronald Reagan’s second term , and people we becoming disillusioned with “The Gippper” as he was affectionately called for his role as football player George Gipp in the movie Knute Rockne, All American about the famous football coach of Notre Dame University. A secret operation now known as the Iran-Contra Scandal, was being played out from the White House. This should have led to Reagan’s impeachment, but of course it was unknown to the general public. Then, on October 5 of that year the pilot Eugene Hasenfus was shot down over Nicaragua and the whole scheme came out. Briefly, the US was selling weapons to the embargoed country of Iran, that had released its captured US embassy officials just as Reagan was being inaugurated, and using the money raised to supply arms for the CIA-backed paramilitary army trying to overthrow the government of Nicaragua against the will of Congress. As a result of all this Americans belief in the sanctity of their country fell greatly. In the chart for this shootdown we see that Saturn is approaching the Ascendant of the United States, and in fact would reach that point by December. Sun is conjunction Saturn — not a good time for US propaganda — and Pluto is tightly sesquiquadrate Mars — war — as it had been for much of the year, and in fact America was engaged in a large scale war in Central America, though the public was kept in the dark about this fact. The previous Saturn conjunct the Ascendant was in 1957. This was in the midst of the Cold War and the President was World War II hero Dwight Eisenhower. Americans believed their country was far superior to the Soviet Union, even though the Soviets had tested an atomic bomb back in 1949. Then, in August of that year, the Soviets tested the world’s first ICBM — Intercontinental Ballistic Missile — and suddenly it seemed that the Soviets could reach US shores with their atomic bombs despite US overwhelming superiority in submarine launched missiles and the many US bases surrounding the Soviet Union. Then, on October 4 the world’s first artificial satellite was launched by the Soviet Union. This again cast doubt on US superiority. A few months later an attempted launch of a US satellite failed to much embarrassment. As a result of this, United States schools were swept up in a huge urge to teach more science and math so US students could be competitive. This was an early preview of the current desire to teach the STEM — science, technology, engineering, math — in all the schools. 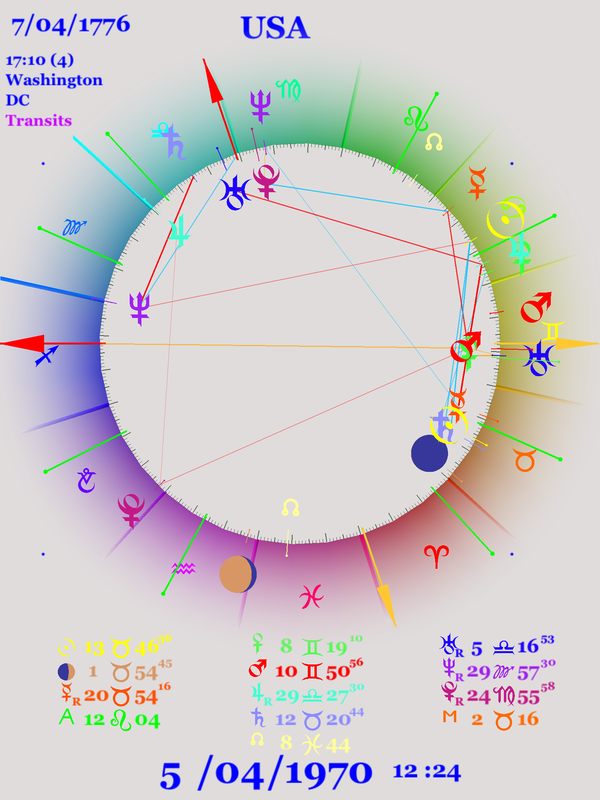 In the chart for the launch of Sputnik, set for the proper time in the East coast (DST), we see Saturn is again approaching the Ascendant, and Sun is again near Saturn, which makes sense since it was the same time of the year. Transiting Jupiter is conjunct transiting Sun — Americans were optimistic about the future and their superiority to the Russkies, but this was about to change. Another important aspect is Neptune square the Ascendant of the US, which is part of a bigger complex that will come into play in the following years. 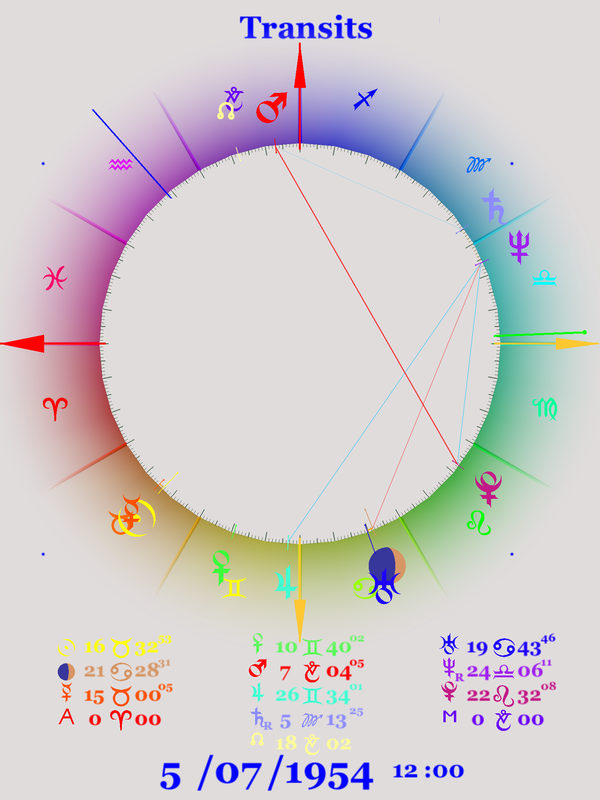 This Neptune square stars in the early spring of 2016, and by late spring we have Saturn on the Ascendant and Neptune square the Ascendant, as we can see in the next chart. The Neptune square continues through the summer, as Saturn crisscrosses the Ascendant, for the last time in early October. 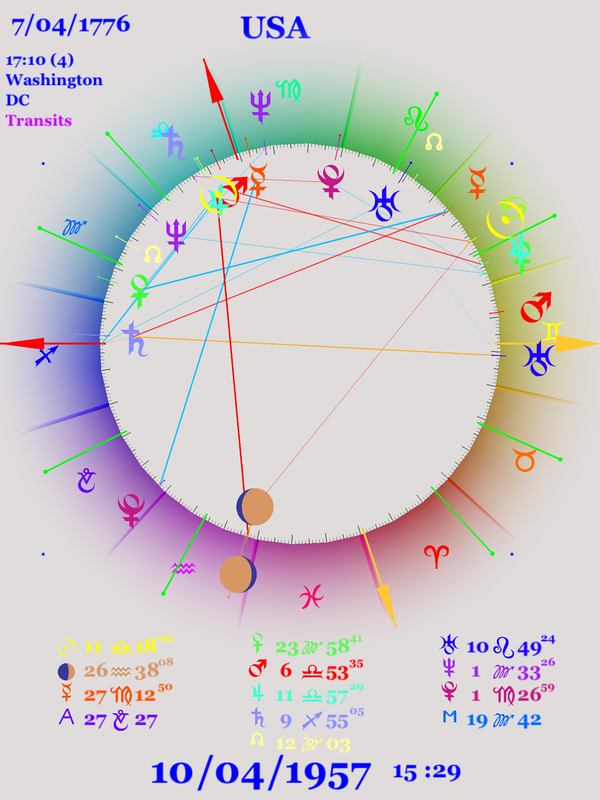 As we can see for the Election Day chart below, Saturn is still close to the Ascendant. Perhaps the outcome of the election will not make Americans feel good about their country or themselves, unlike the election of 2008. Also in late summer and early fall Pluto retrogrades so it is widely opposite the Sun of the United States, a position it has occupies for much of the last few years, as there has been increasing criticism of the President and the Congress is held at record low esteem. Besides the square of Neptune to the Ascendant 2016 will also see the trine of Neptune to the US Sun. These three factors will be influence the mood of the country during 2016. The important Neptune aspects suggests, and from reading the news this is obvious, that the US will become weed crazy in the following years. The capitalists have begun to be interested in marijuana, and once the capitalists are involved it is difficult to hold back. Lenny Bruce, the acerbic comedian of the 1950s and 1960s, and a forerunner of many comedians today, once said that marijuana will become legal once the lawyers started smoking it. In this he was wrong. It now appears what pushed the envelope was some Baby Boomers started turning 65 and they realized they needed the aid of a plant they were familiar with when younger to help with the aches and pains they felt as the grew older. This coupled with a younger generation that was influenced by the drug war propaganda (but not in a positive direction) they got as young people tipped the balance, as was mentioned by an earlier post. The last time Neptune was in a similar position was in 1853 and 1854, shortly after a Uranus-Pluto conjunction. This was a few years after Prohibition has been passed in the state of Maine (same link as above) and in began to spread to other states, ultimately culminating in the passage of National Prohibition in 1919, which took place the next year. This had a large affect on the country, though I don’t know if everyone would consider it positive. Among the many changers to the country was a widespread ignoring of the law, much corruption, and the rise a criminal gangs. But these two aspects occur at the same time, as this next chart illustrates. Here is one with Saturn square Neptune, with Saturn quite exactly on the Ascendant of the US and Neptune closely square the Ascendant of the US. We have discussed in the past the hard aspects of Saturn and Neptune, and here is yet another one. This hard aspect is also closely connected to the US. In this case this aspect suggests that America will realize that some policies or beliefs it has followed are no longer serving the country. We can already see this happening; there are so many beliefs that are coming under scrutiny now, the list is long. The war on Drugs and how the police interact with communities is coming under increasing criticism as people ask more and more questions. These are even spreading to the presidential campaigns of both Democrats and Republicans, while it has been a major topic of third parties for a long time. A long term aspects, over the last few years, has been Pluto opposite the Sun of the United States. This has lasted so long since Pluto moves so slowly. The last exact pass will be in the fall of this year as goes stationary on the US Sun. But there is one further close pass in October of next year and, as you can see from the next chart, at this point Mars conjuncts Pluto. While the opposition with the Sun is not exact, the square with the US Saturn is very close. This also accentuates the natal Sun square Saturn of the US. As one can imagine, Sun-Mars combinations are not very pacific — Ebertin gives the phrase “force, brutality”. Pluto opposite the Sun has seen intense opposition to the President, and the government in general, over the last few years. As evidence, if any is needed, just look at the low esteem those institutions are held by the populace, as shown in many polls. With this final Mars-Pluto opposite the Sun in the weeks before the election, one can expect to see fervent opposition displayed in the country. 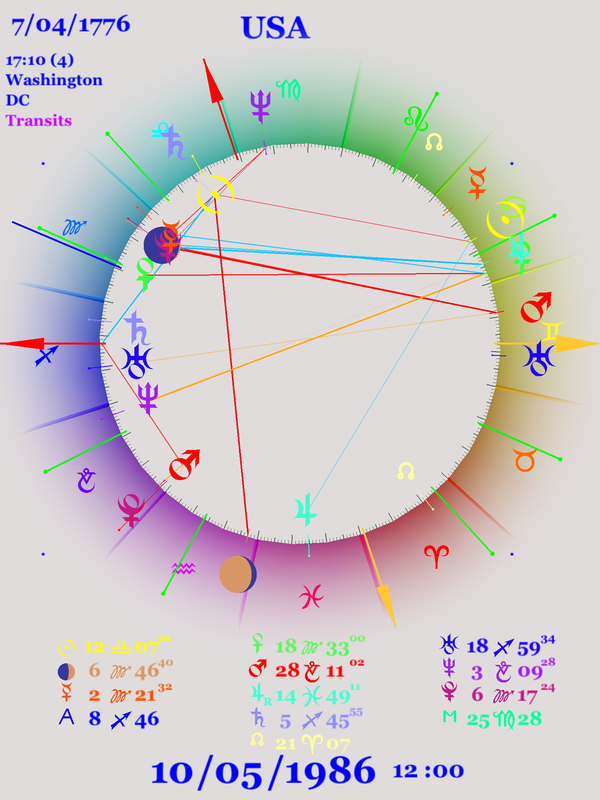 Finally we have a graphical ephemeris for the entire year. In this we can see Saturn first crossing the Ascendant at the beginning of the year, and then crossing it again in June just as Neptune also squares the Ascendant (black arrow) and then crossing it a third time in October (red arrow). Meanwhile, we see the Uranus-Pluto square close at the beginning of the year and the Pluto and Mars conjunct near the US Sun later in October (green arrow). We have just seen a couple of more anniversaries in the preceding week, and they are both related. It all started out in the Nineteenth Century. Britain showed that the way to be a world power was to have colonies in countries that were not European. For Britain the most notable example was India. So other European powers thought they needed some colonies of their own — there was still plenty of the world left that Britain had not grabbed, especially in Africa and Asia. So France captured the countries of Southeast Asia now known as Vietnam, Laos, Cambodia — the region known as Indochina since it is between India and China. This happened starting in 1887. The natives of Indochina were not happy with this arrangement, but the colonies endured. But at the beginning of World War Two, France fell to the Germans and it was either occupied by Germany or else the Vichy government controlled part of France, and the Japanese occupied Vietnam. Shortly before the Japanese attacked Pearl Harbor, an organization called the Viet Minh was formed in Vietnam to fight the Japanese occupation of the country. The Viet Minh were led by someone who would become well known later in the United States by the name of Ho Chi Minh. Part of his desire for freedom was based on that founding document of the United States, the Declaration of Independence. At that time he still though of the United States as a bastion of freedom. When the Japanese were defeated, he declared Vietnam a free country, but the French, also liberated, but from Germany, decided to regain control of Vietnam. Since the French had suffered through the Second World War, they did not have the resources to support a war in Indochina (even with money from the US Marshall Plan), so a majority of the money they needed to battle the Viet Minh was supplied by the United States under the Presidency of Harry Truman. The final battle of that first Indochina War was at Dien Bien Phu where the French were surrounded by the Viet Minh. The United States considered supplying nuclear bombs to defeat the Viet Minh, but fortunately that was never acted upon since the French soldiers and the Viet Minh were in such close proximity that the French would also have been killed if nuclear weapons had been used. The Viet Minh overran the French position and that was the end of French colonial ambitions in Vietnam. Here is a chart for the fall of Dien Bien Phu to the Viet Minh. 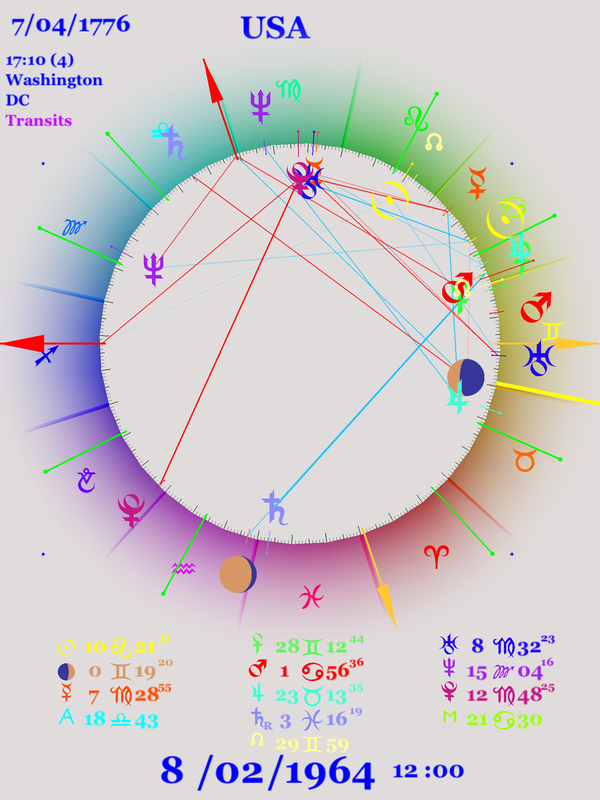 Mars is sesquiquadrat Pluto –explosive violence — and this battle is still important. In fact, one of the best correspondents of that war, before he died in 1967, was Bernard Fall, and his history of this battle is called Hell in a Very Small Place. 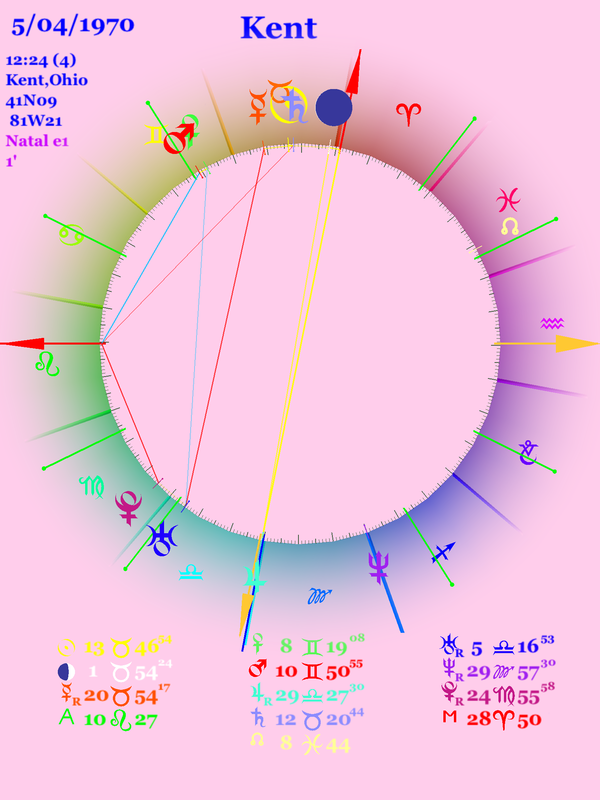 In the fourth harmonic chart of the same event, we see Saturn half way between the Sun and Neptune — delusions come to a sorry end. And to show that the United States has been involved in Vietnam for a long time, here is a chart for the first American killed in Vietnam. The man killed was a U.S. Army officer serving with the OSS (Office of Strategic Services — the forerunner of the CIA) and killed by the Viet Minh, who thought he was French. In this chart of the death of the first US soldier in Vietnam — the first of many — transiting Mars is conjunct the transiting Node (we will see this same configuration at about the same place later in the Gulf of Tonkin Resolution) and near the Sun of the US — the country would be involved here for the next 30 years, but that was not suspected at the time. Emperor Bao Dai (backed by the French from 1949) was granted control of the Southern part of the country. A peace agreement was signed in 1954, allowing the withdrawal of the French, with an election to be held, and the country was temporarily divided at the 17th line of latitude. Dwight Eisenhower, the President of the United States, thought that Ho Chi Minh would easily win that election. But the elections were never held, the United States decided to support Bao Dai in the southern part of Vietnam as an anticommunist bulwark against the North. This was the height of the Cold War, and any threat from the Communists was threat to the “Free World”. After all, the United States had recently “lost” China and they were not about to allow that to happen again to Vietnam. In 1955, the Catholic Ngo Ninh Diem defeated Bao Dia in an election (probably rigged) to become president of South Vietnam. He ruled a majority Buddhist country and there were continual protests by Buddhists of his discrimination against them, eventually reaching the level of self-immolation. The United States first began to send troops to Vietnam after the Gulf of Tonkin Resolution was passed by the US Congress. This was in response to an incident where the North Vietnam fired on a US Cruiser, though facts about that incident since then have cast doubt on the action, but it was one of many acts that were used to get a nation into war. In the chart for the Gulf of Tonkin resolution there is a tight Uranus Pluto conjunction, with Mercury there as well. This action determined much hat was to transpire in the upcoming years and affect the lives of many, many Americans. 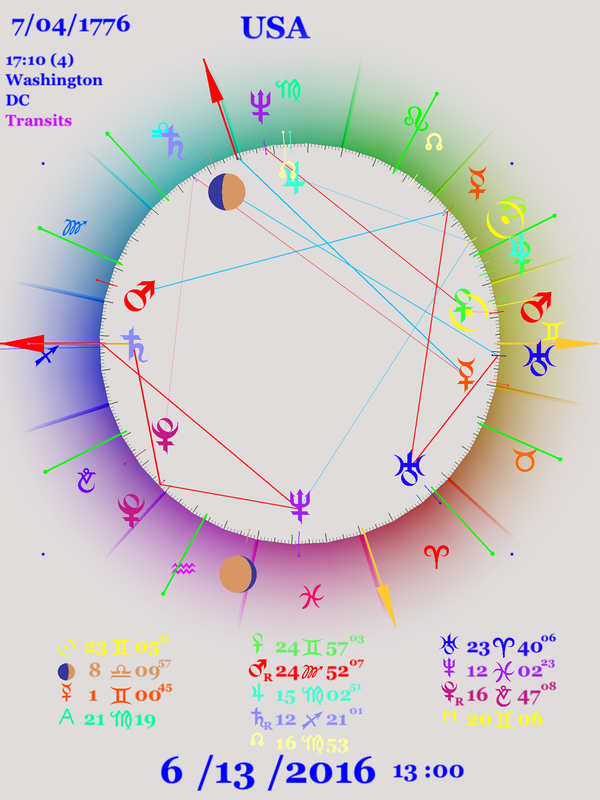 Transiting Mars is conjoined transiting North Node (as we saw in the death of the first US soldier), suggesting again that this violence will touch many lives. 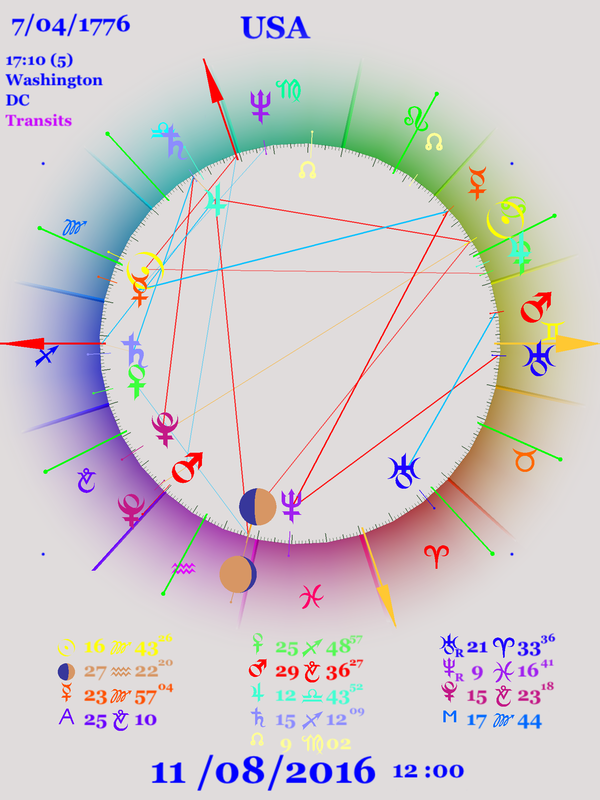 In the chart for the arrival of the first troops that were promised by that Resolution, we see the same Uranus Pluto conjunction, but this time joined with Mars — gunfire — instead of Mercury. The same Moon-Jupiter conjunction seen in the Gulf of Tonkin chart is here again. Many Americans were so optimistic that this would work out well! The United States continued to send troops to Vietnam during the Sixties, resulting in wide-spread protest in this country against that. At that time there was a draft in the US and all young males had to appear for a draft physical. Student deferments while being in college were popular, and upon leaving college ex-students found themselves receiving draft notifications, which resulted in widespread draft card burnings. After Johnson resigned Richard Nixon was elected in 1968 to continue the Vietnam War. On April 30, 1970 — a date that is celebrated as an anniversary but not for the 1970 decision– Nixon announced an “incursion” into Cambodia and the college campuses erupted in protest. On May 4 National Guardsmen at the campus of Kent State in Ohio killed four students and wounded nine others. More protest and students strikes spread across campuses in the country, involving even students who had not protested the war. People in Ohio heavily backed the National Guardsmen. Less than three weeks later the song “Ohio” was written by Neil Young and recorded by the then “super-group” Crosby, Stills, Nash, and Young, with the haunting line: “Four Dead in Ohio”. It was released the next month and became an anthem. 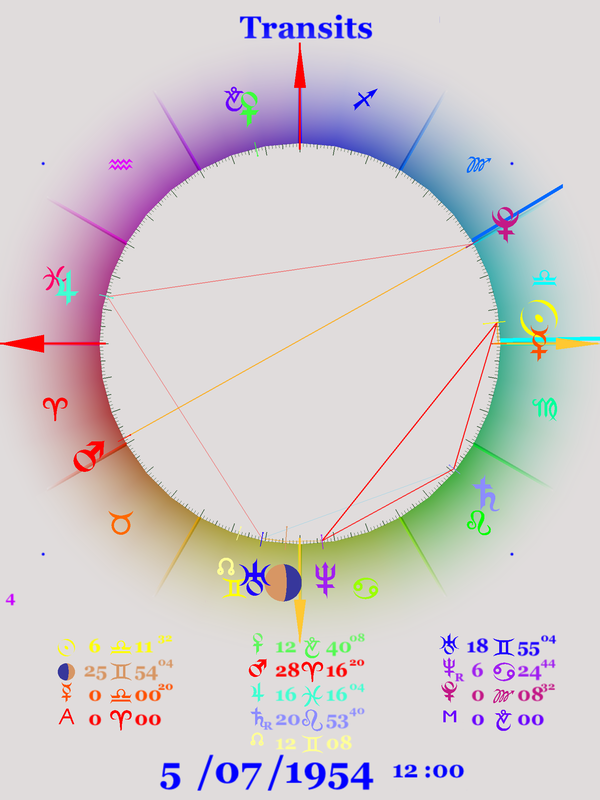 In the event chart for the Kent State shooting, we see that it is just before the New Moon (about one day) and the Moon was on the MC at the time of the shooting — it was a very public shooting and the whole world was aware of it. Saturn is conjunct the Sun, speaking of the depression that resulted, at least among some people. 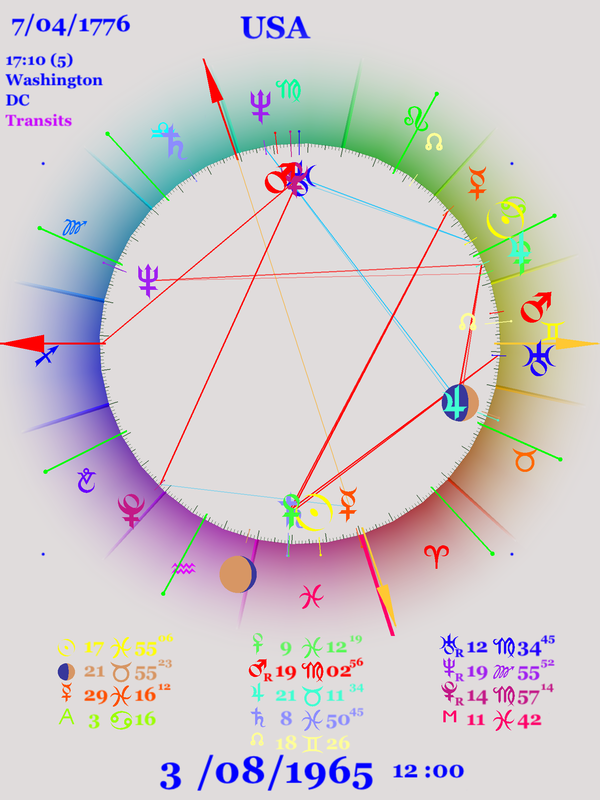 Jupiter is at the lowest point, opposite the MC, and luck was certainly not present in this incident — “What if you knew her and found her dead on the ground .” Pluto is semisquare the Ascendant and occupies the same relative position that it does in the US chart. The fourth harmonic version of this event chart allows us to see the aspects more easily. 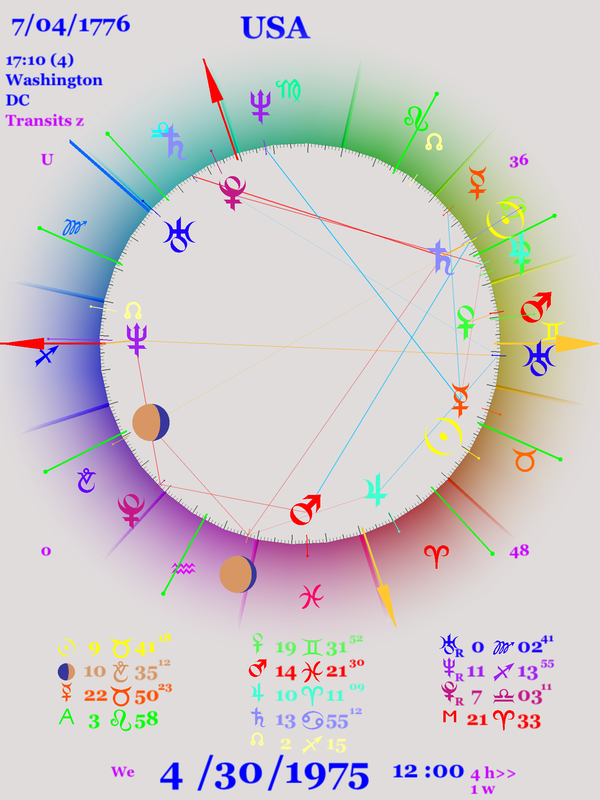 In the chart for the event on the US chart, we see that the midpoint of Uranus and Pluto is the MC of the US and Mars is on the Descendant — this was a martial event — “Tin soldiers and Nixon coming … Soldiers are cutting us down”. Also, less than two weeks later, at Jackson State College in Mississippi, two students were killed by police in a similar protest to that in Ohio. But this did not get as much notice, partly because it happened later and partly because black students were killed, and there was nothing unusual then, and there is still nothing unusual, about black people being killed by police, as any number of recent incidents can attest to. But killing white students was unheard of, which is partly why it so upset other students. However, for many Americans, the students got what was coming to them. But the Vietnam War was far from over, even though there were withdrawals of American troops from that country. In 1973 a forgotten peace agreement was signed in Paris. But the real end of the war, and another anniversary, is the rapid withdrawal of the final American presence from Vietnam on April 30, 1975. The is Reunification Day, a holiday recognized in the reunited Vietnam and especially in what is now know as Ho Chi Minh City. It is hard to place an exact time for the withdrawal. At 10:24 that morning (Saigon time) there was an unconditional surrender by the leader of South Vietnam. But the actual withdrawal of the last US helicopter took place later that day. At the time Saigon was 8 hours East of Greenwich, and thus 12 hours (Daylight time in East coast) from Washington. 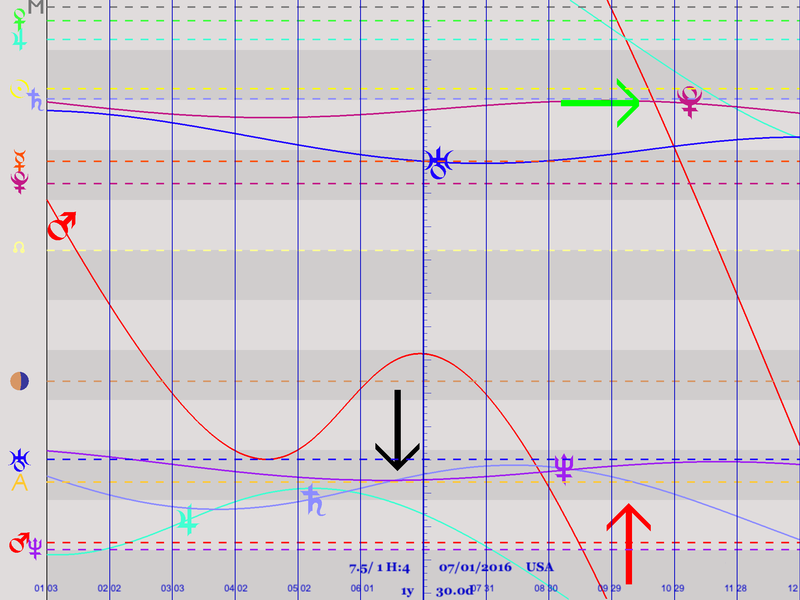 I’m using a chart set for Noon on the East Coast of the US. Pluto is just past the MC and very elevated in the chart. Saturn is on the Sun of the US (depressed country!) and Neptune is on the Ascendant of the US, perhaps suggesting the bewilderment of United States citizens at this turn of events. Uranus and Pluto are far apart, the Sixties have ended. 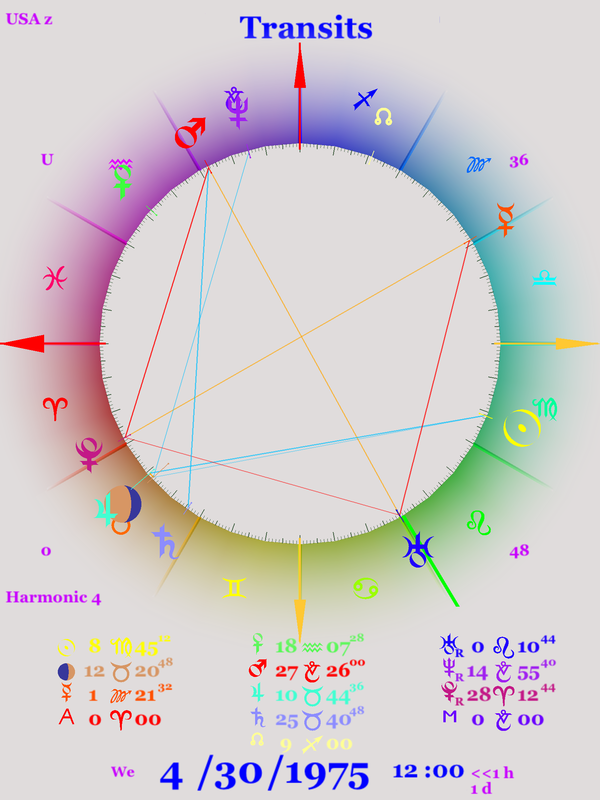 If we look at the fourth harmonic chart we see that there would be a grand square except that the Mercury-Pluto square is too wide. However, Mars is square Pluto, suggesting some of the violence that came at this withdrawal, and the condemnation that followed in the United States regarding a “stab in the back” of our brave forces. 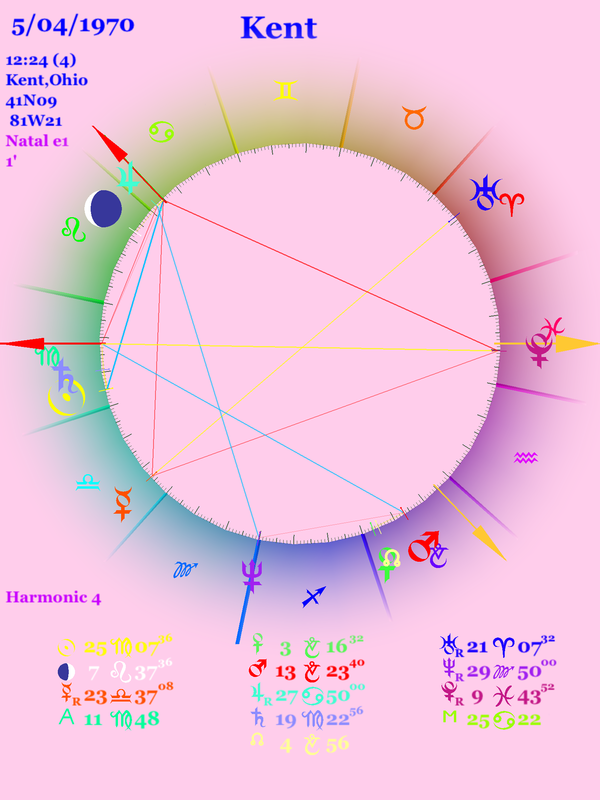 And notice that Uranus and Pluto are square in the fourth harmonic chart , and in fact the two planets are separated by a semi-semisquare of 22.5 degrees.